1. Pull the seat slide adjustment lever up and hold it. 2. Slide the seat to the position you desire. 3. Release the lever and make sure the seat is locked in place. Adjust the seat before driving, and make sure the seat is locked securely by trying to move forward and backward without using the lever. If the seat moves, it is not locked properly. 1. 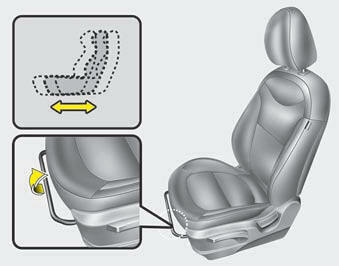 Lean forward slightly and lift up the seatback recline lever. 2. 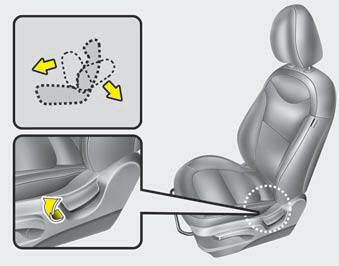 Carefully lean back on the seat and adjust the seatback of the seat to the position you desire. To change the height of the seat, push the lever upwards or downwards. 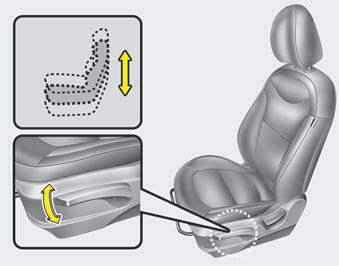 To lower the seat cushion, push the lever down several times. To raise the seat cushion, pull the lever up several times.